We offer extensive and comprehensive range of Safety Headlamps. 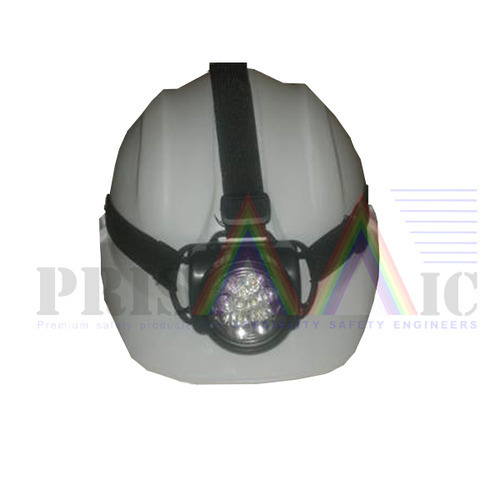 This LED Headlamps is used in work areas which are prone to higher risk of accidents. I. Nine LED Head Lamp without Helmet. II. Operates on two AA batteries. III. This system allows the light body to be attached interchangeably to a helmet with the help of its elastic headband. IV. The product Safety Helmet Lamp is designed keeping in mind all innovative approaches to workforce safety and demands, made by industries worldwide. In addition, we offer varied range of Safety Helmet which are being widely used in industries like Metallurgical, Steel, Aluminium, Power, Energy, Petrochemical, Oil & Gas, Glass, Chemical, Cement Offshore & Onshore Industry, Furnace Areas, Fire Departments, etc.